I know you are lil bit confused why I written down all those name started from Latter “V”. Well Today I m going to differenciate all those things so you will not confused next time, As I do when I started working with VMware… Hope this will be a interesting topic for you….So read Carefully…. 1. Vsphere 5.0 : This is a complete package of Vmware Hypervisor ESXi (OS) + vSphere Client(Management Point)..
And other things you can understand better by below scenario…. 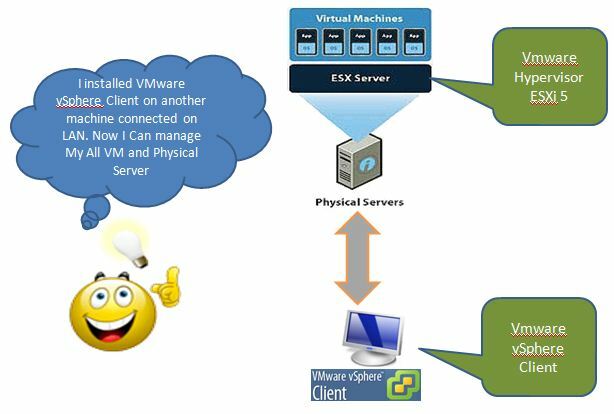 Scenario : 1 – ESXi Server Ready..But no way to administer it. No Management Point.. Solution :Vmware vSphere Client installed and now it’s ready to manage the ESX server and there VM. Scenario : 2 – Multiple ESXi Server are ready but how to manage them along for Vmotion, Distributed Power Management (DPM), Distributed Resource Scheduler (DRS), High Availability (HA) etc.. If you find reading this helpful and cleared your doubts than comment and if still have any doubts den query me. will try out to clear your doubts more clearly…Thanks..